Many medications can cause nutritional deficiencies, and proton pump inhibitors (PPIs) are no different. Anyssa Garza, PharmD, BCMAS, received her doctor of pharmacy degree from The University of Texas at Austin. She is the vice president of Content and Patient Education Programs at Digital Pharmacist and an adjunct assistant professor at The University of Texas at Austin College of Pharmacy. 1. Nutrient depletion. Natural Medicines Comprehensive Database website. naturaldatabase.com. Accessed June 12, 2018. 2. Common drug classes, drug-nutrient depletions, & drug-nutrient interactions. Nature Made website. naturemade.com/~/media/Images/NatureMade/PDF/Health%20Care%20Professionals/HCP%20Updates%20042315/Common%20Drug%20Classes%20and%20Nutrient%20Interactions%20Chart%20FNL.ashx. Published 2015. Accessed May 6, 2018. 3. Boghossian TA, Rashid FJ, Thompson W, et al. Deprescribing versus continuation of chronic proton pump inhibitor use in adults. Cochrane Database Syst Rev.2017;3:CD011969. doi: 10.1002/14651858.CD011969.pub2. 4. Yu LY, Sun LN, Zhang XH, et al. A review of the novel application and potential adverse effects of proton pump inhibitors. Adv Ther.2017;34(5):1070-1086. doi: 10.1007/s12325-017-0532-9. 5. Farrell B, Pottie K, Thompson W, et al. 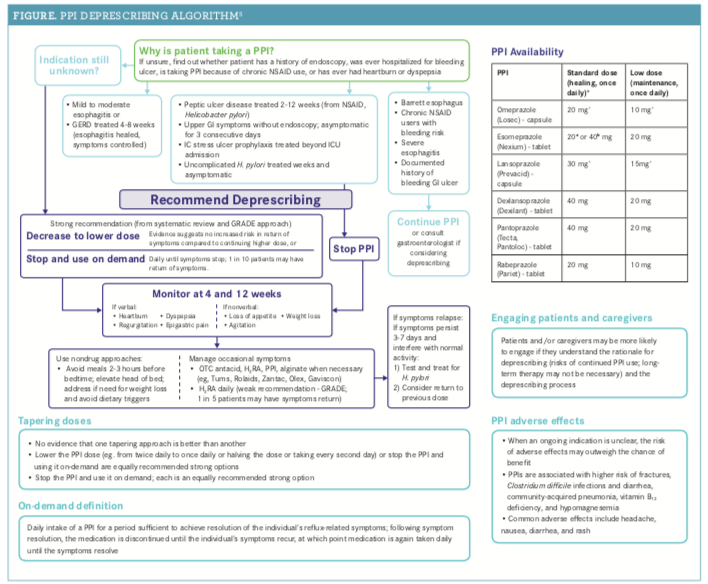 Deprescribing proton pump inhibitors: evidence-based clinical practice guideline. Can Fam Physician.2017;63(5):354-364.